Our seventh application, ECHO: An Echocardiography Reference, has been approved by Apple and has been posted on the iTunes App Store today! ECHO: An Echocardiography Reference is designed for the dynamic environment of the perioperative echocardiographer. A user friendly source of specific information; ECHO allows a quick look up of normal values, severity cutoffs, formulas and calculations. 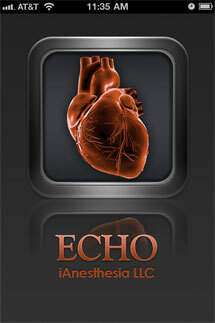 To learn more about our ECHO app please visit http://www.iAnesthesia.org/apps/echo/.